Ontology matchers tend to require ontologies to be matched (this is the least). 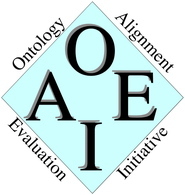 Yet SKOS thesauri are not really ontologies. So people may want to translate SKOS thesauri into OWL ontologies. We are aware of at least two ways to achieve this. if participants' tools output alignments involving defined classes using owl:intersectionOf and owl:unionOf respectively, the concerned statements will be interpreted as statements involving skosm:AND and skosm:OR. Disjunction-like statements (owl:disjoint, owl:differentFrom, owl:disjointWith, owl:ComplementOf which could be interpreted as statements involving skosm:NOT) will be ignored, as these are not evaluated.